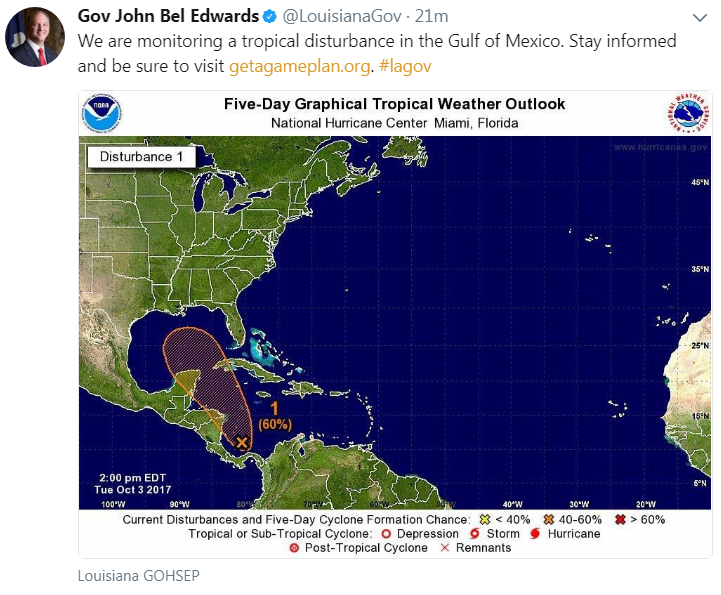 BATON ROUGE - Governor John Bel Edwards said residents need to stay informed as forecasts suggest tropical development could move into the Gulf of Mexico. At the time of this post, the disturbance is located in the Caribbean Sea near Nicaragua, Costa Rica, and Panama. The National Hurricane Center predicts the disturbance has a 50 percent chance of developing into a tropical cyclone in the next two days, and a 70 percent chance of development in the next five days. Forecasts suggest if a tropical cyclone were to develop, it could enter into the Gulf of Mexico. A cone of uncertainty predicts a potential tropical cyclone could follow a path anywhere between Texas and the Florida panhandle. As always, you can stay up to date on tropical development in the WBRZ Hurricane Center, following @WBRZweather, and by downloading the WBRZ Weather app.